One proposal for an enhanced transit system. Image: CU Denver. Unlike Boston or New York, the Mile High City grew up around cars and maintains a robust network of wide, speedy roads — infrastructure at odds with the world-class transit network the city government says it wants, and that Denver residents demand. 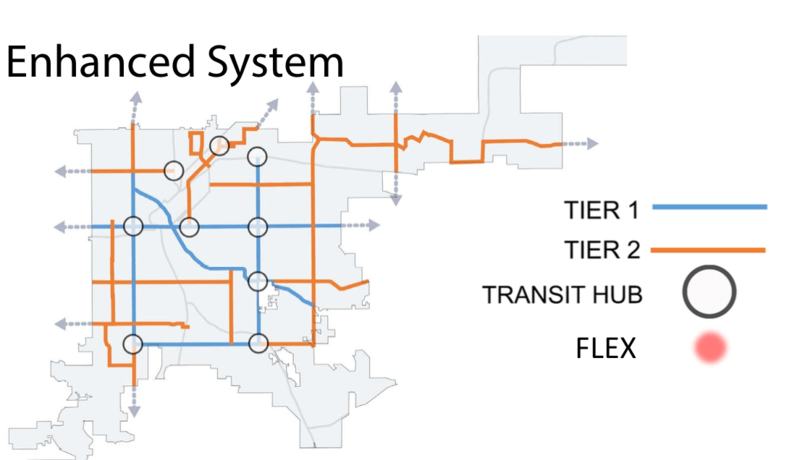 It might surprise you (perhaps not if you ride RTD often), but no comprehensive plan exists to enhance Denver’s lackluster intra-city transit connections. Instead, FastTracks, the massive new regional rail network, has hogged both the spotlight and the money for the past decade. But that’s about to change. Planners will embark on developing a better connected, more efficient, and more equitable transit system tailored to Denver-proper this fall, but students from CU-Denver’s Urban and Regional Planning masters program have already given them a head start. Two teams spent the last four months developing complete transit plans for the city with the guidance of their professor and help from the city’s planning and engineering departments. The plans, presented at a Transit Alliance event Thursday, are not official — the city will develop the actual strategy with consultants — but are springboards to get staff thinking about major concepts. The students’ work provides key insight into what must happen for the city to become transit-rich – everything from physical engineering to replacing RTD’s obsolete payment method to combatting the social stigma of buses. Students identified critical corridors for “tier 1” (e.g., light rail, bus rapid transit, or streetcars) and “tier 2” options (e.g., buses with 5-minute headways during rush hour). Parts if not all of Federal Boulevard, Colfax Avenue, Colorado Avenue, Speer Boulevard, Quebec Street, and Evans Avenue need the highest-quality service, they say, to more seamlessly move people, better serve transit-dependent riders, and grow total ridership. The budding planners also ensured that no transit stop was more than a quarter-mile from any start- or endpoint. They tackled the social barriers to transit use as well. Transit is not ingrained in Denver as it is in New York or Boston, and that’s a hindrance. “Dignity” was a word used often. That means city departments committing to the upkeep of safe, attractive, and permanent bus stops, for example, or providing lighting to remove fear from the equation when it comes to taking a late-night bus. All great ideas, but how would they work in practice? The City and County of Denver will not own and operate a transit company — they would buy up service from RTD and probably rebrand the local system, like Boulder has done. Schroeppel didn’t want his students’ creativity constrained by money, but at the same the projects had to be feasible. Schroeppel estimates it would cost $1.5 billion over a three-phase, 15-to-20-year period. That’s less than one lane-widening project on I-70. It will take some risk and perhaps some creative funding mechanisms, a la FasTracks’ tax levy, to make Denver a transit-rich city. But the CU Denver proposals managed to be simultaneously aspirational and realistic. A truly connected, convenient, and equitable transit system must be one of those transformative projects. Full disclosure: I’m a long-range planner for RTD. Granted, RTD does have an “obsolete payment method.” But “lackluster intra-city transit connections?” RTD needs to be a “better connected, more efficient, and more equitable transit system?” Based on what data? Compared with what other transit systems? For contrast, you might look at Los Angeles, where there has been a serious effort to put light rail (or even subways) down the main in-city routes. 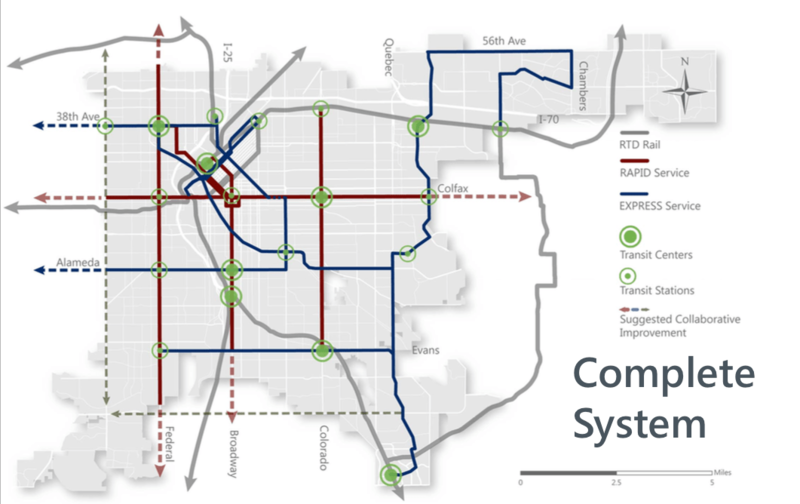 It’s just *odd* that there isn’t a plan for a trunk line down Colfax, and it smells of biasing towards suburban and inter-city trips and against in-city trips. Oh, and for what it’s worth, Colfax is so wide that it would be perfectly straightforward to have dedicated lanes for the light rail (like Boston’s Green Line). Let’s use route 15 as an example. Downtown it turns down Larimer a half mile short of Union Station—when the Mallride isn’t running that often it’s a serious pain to transfer at Union Station or walk to Lower Highlands. On the east end a good chunk of the runs end at Krameria, which is just short of the north/south bus service on Monaco and Quebec streets. Stopping there would only add a few minutes to each run, but right now it’s 10-20 minutes of walking or waiting for the next 15L. Not to mention, in August RTD is proposing removing all of the 15’s stops on the Anschutz Medical Campus. If anything, RTD should be looking into adding more stops to connect campus to the Colfax light rail station. I could add that the only downtown enhancement in Fastracks, the Central Rail Extension, appears to be stuck in permanent funding limbo, while extreme-sprawl extensions to centerless car-dependent suburbs — like the Southeast Extension — get funded. Just a lot of things pointing to “We care about the suburbs, and not about the urb”. They’ve started to move forward a bit with it and the plan currently is to make it a street car that just goes from 38th and Blake and then does the downtown loop, renaming it the L line. The RTD Fastrack site has been updated recently. Completely agree on your other points. I mean, Toronto’s had a plan for electrified GO service for *30 solid years* but they weren’t taking it seriously because it hasn’t had a penny of funding until last *month*, and no construction has been done. My local city has had a plan for sidewalks in front of my house for *20 years* and not a damn thing has happened (and not a damn thing will happen). Planning is meaningless without funding. Do us a favor and resign. Where are you on connecting the north area to Denver, RTD? Nowhere, in my experience. It has taken FasTracks (oh so FasT, truly) until 2016 to connect the areas along I-25 to the north. There are gaps in coverage all throughout the north suburbs, as we are expected to own a car. There is much to be done here, and comparisons to other cities impress me none, when OUR city is not served properly. This guest works as a long-range planner for RTD and thinks RTD doesn’t have an obsolete payment method and that RTD doesn’t have a lackluster intra-city transit system? This person needs to be fired. All in RTD who think like this need to be fired. Denver’s entire transit system is a commuter system. It is not an intra-city transit system. If they are trying to argue that “it is,” they do not know enough about their field of profession to continue employment in that profession. Warren: Stop. Your destructive actions, calling for the termination of an employee for risking the stating of his opinion, are how we all lose an “insider’s” view of RTD. At this point in time, Denver isn’t really in need of higher-level improvements such as BRT or LRT on the local grid routes. RTD’s Service Scheduling department is unparalleled in the US for their ability to effectively use what service resources they have in an efficient manner: RTD’s routes operate on a solid grid system, with very good spans, clockface scheduling, reasonably spaced stops, and timed connections. At this point, until service plans are released from RTD for the new rail lines specific local-service routing discussion is challenging. What RTD is missing is frequency. The densest neighborhood in the whole state, Capitol Hill, sees hourly evening and Sunday frequency on routes 6 and 12, and half-hour frequency save for a short boost to 15-minute frequency in the peak-direction peak hours. The Highlands are serviced by five routes (routes 6, 28, 32, 44, 52), but all routes operate hourly with the exception of one route on Saturday (route 52), with no clear attempt at coordination of schedules between the five routes. As RTD operates on a grid system, untimed connections tend to dominate, and thus it is more imperative that all routes either operate every 10-20 minutes all day or that timed connections are well publicized for worse frequencies. Actually, Denver really is in need of higher-level improvements on Colfax, where buses are delayed by being stuck in traffic. Most of the other grid routes are on absurdly overbuilt insanely-wide roads where traffic isn’t an issue, so they primarily need frequency, as you say.